Manray Express Freight Systems, Inc are Freight Forwarders based in Miami, Florida. We are a fully licensed US Customs Bonded Export Warehouse Facility capable of handling every kind of freight.We operate a 30,000 Sq Ft Full Service US Customs Bonded Warehouse and Transportation Company. Manray Express offers an almost unlimited array of Warehousing, US Customs bonded export, freight forwarding and transportation services as well as non-bonded services. We Also Offer Tax and Duty Free Purchasing and Sourcing Services through our sister company Caribbean Export Supply. Manray Express Freight Systems, Inc should be your first choice in Customs Bonded Services, Transportation and Freight Forwarding Services. Manray Express is a licensed US Customs bonded and insured export consolidation facility able to handle all of your Customs bonded in-transit cargo without clearance into US commerce. This means NO Tax and NO Duty. We are able to provide you with a complete tax and duty free transfer and transportation solution from container to container, Airport to LTL or door to port. We can move your cargo or container to our US Customs bonded warehouse, unload the cargo from the original container and prepare it for immediate exportation by either reloading the cargo into a different container or delivering it to the freight forwarder of your choice. We can also provide a complete freight forwarding solution to include all ocean freight bookings and charges, bills of lading, and Shippers Export Declaration (SED) and cargo insurance. All of these services without a formal Customs clearance entry or importers permit or importers bond. Wholesale Distributor services, Export NVOCC and Air Freight Forwarder and US Customs Bonded Common Carrier. Our sister company Caribbean Export Supply is also a Licensed Spirit, Beer, Wine and Tobacco Importer and Exporter and we offer broker assisted secure transactions and secure escrow accounts. We are an FMC licensed N.V.O.C.C. Our license number is 022418NF. We offer agency representation in Port of Miami and Port Everglades. We can file import and in bond entries electronically and provide US Customs bonded transportation service to or from any port electronically. International Tax and Duty Free Purchasing Agent, Duty Free Supplier of Spirits, Wines, Champagnes and Liquors. Purchasing sales and marketing of all major brands beverage brands tax and duty free. We offer duty free products including but not limited too liquor, beer, wine, food and other beverages through our sister company Caribbean Export Supply. We are both importer/buyer and exporter/seller. We offer US customs bonded in-transit through the US to frontier ports and foreign destinations. We can purchase products for you or sell you our products. 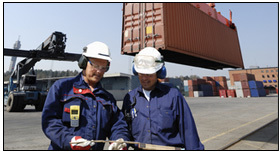 We offer bonded and non-bonded cargo export consolidation. US Customs brokerage is also available.